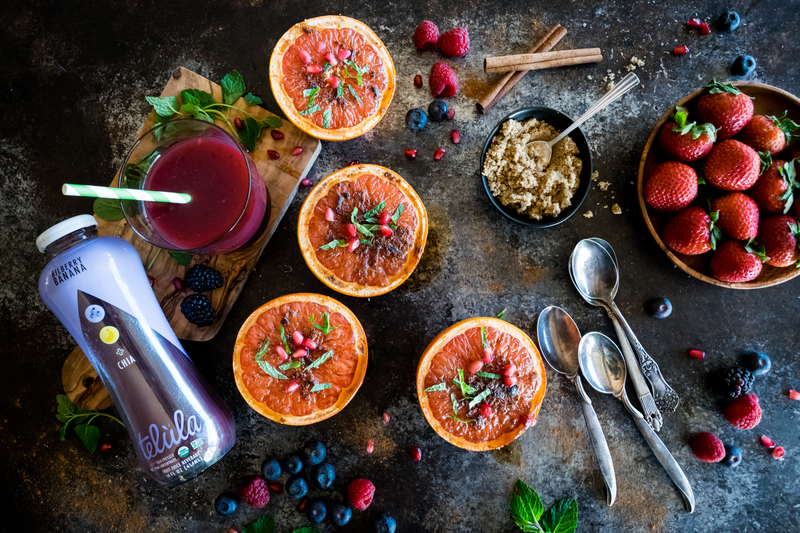 We are excited to partner with TheFeedFeed & Telula to create a refreshing breakfast that pairs perfectly with their Bilberry Banana Chia cold-pressed juice—and we’re thrilled to announce that as 2017 Brand Ambassadors for Telula, we’ll be sharing more recipes and ideas all year long! But first we’d like to take a moment and thank our star ruby grapefruit tree for helping us break the record of Palomas and Greyhounds consumed in one winter. We have been grapefruiting everything lately and decided we had to share one of our favorite ways of preparing this super citrus. If you’ve never tried brûléeing grapefruit before, this is a quick and delicious way to enjoy them. Generously sprinkled with brown sugar and cinnamon, halved grapefruits are broiled in the oven until the sugar begins caramelizing and bubbling, forming a sweet and crispy top. Served warm, garnished with chopped fresh mint, and paired with a glass of smooth Bilberry Banana Chia, it’s a colorful and healthy way to start the day. Now excuse us while we go see if there’s any fruit left on our tree! Telula has 10 blends -- Six Fruit & Veggie Blends plus Four Chia Blends. You can use Telula's nifty store locator to find your closest retailer. Cut the grapefruit in half horizontally. Cut a thin slice from the bottom of each half so they sit flat. Using a grapefruit knife or small paring knife, carefully cut between each segment of fruit and the white membrane around it, loosening the fruit so it will be easier to eat. Place the halves on a baking sheet. In a small bowl, mix together the sugar and cinnamon, then sprinkle the mixture over the grapefruit halves. Turn on the broiler to 500°F and place the baking sheet on the top oven rack, so the grapefruit is a few inches away from the heat source. Watching the fruit carefully with the oven door open, cook until the sugar caramelizes and bubbles, searing slightly, about 3-5 minutes. Remove from the oven and serve warm, topped with mint leaves if desired. Enjoy!